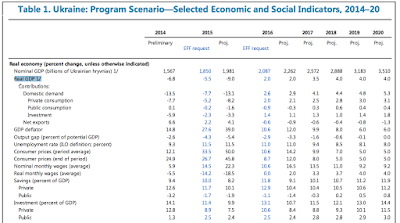 IMF just published its Article IV consultation paper on Ukraine. Here are some key points (I am staying out of extensive commenting on these, but emphasis is added in the quotes). 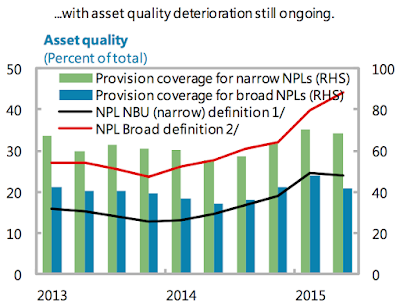 Before we start, it is important to highlight that IMF notes significant breadth and depth of reforms already undertaken by the Ukrainian authorities, albeit warns about potential slippage in future reforms. Given the overall environment (geopolitical and domestic) in which these reforms are taking place, Ukrainian Government deserves a positive assessment of their work in a number of important areas. "The 2015 baseline growth projection has been marked down to -9 percent (relative to -5.5 percent at the EFF approval), driven by a delayed pick up in industrial production, construction, and retail trade, and expectations of a weaker agricultural season." Note: this is a massive contraction compared to Programme projections. "Domestic demand will be somewhat more constrained than anticipated earlier by tighter credit conditions and larger-than-expected decline in real incomes amid higher inflation." "Growth is expected to start recovering in the second half of the year, supported by growing consumer and investor confidence, gradual rehabilitation of the banking system, and restoration of broken supply chains in metals, mining, and energy production. Later on, manufacturing should also start benefitting from the restored competitiveness of Ukraine’s exports. 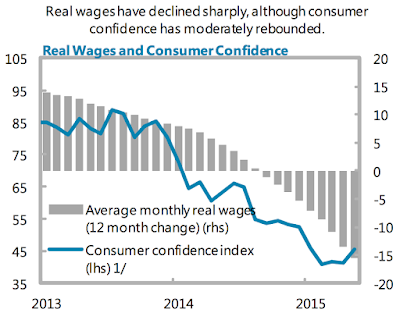 However, the recovery is expected to take hold only gradually through 2016. 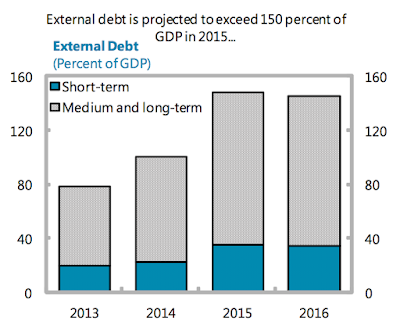 Medium-term growth projections remain unchanged." Note: you can see projections for following years in the table at the end of this post. 27 percent at program approval, driven by the faster-than-expected pass-through effects of the large exchange rate overshooting in March." 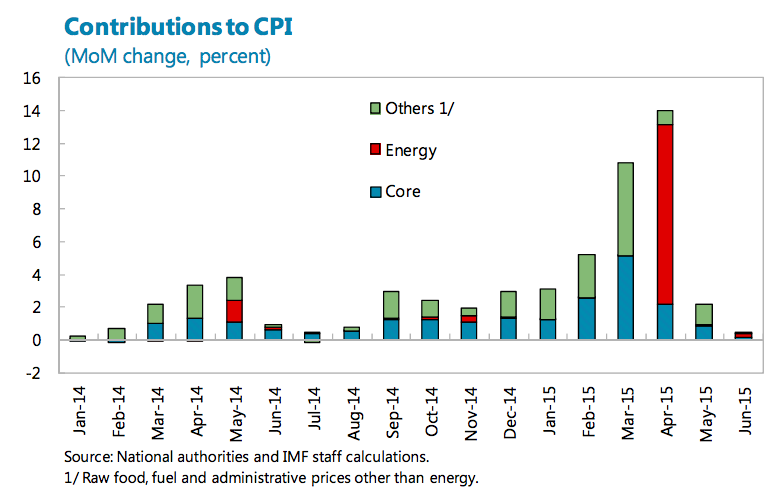 Note: again, this is a massive revision on programme-assumed inflation. 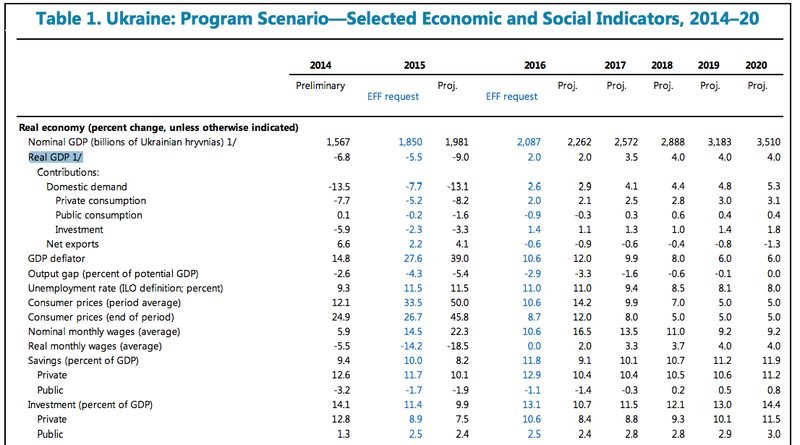 Take together with the GDP revision above, it is hard to see how the IMF can continue arguing sustainability case for the programme at this stage, without hoping for massive recovery. 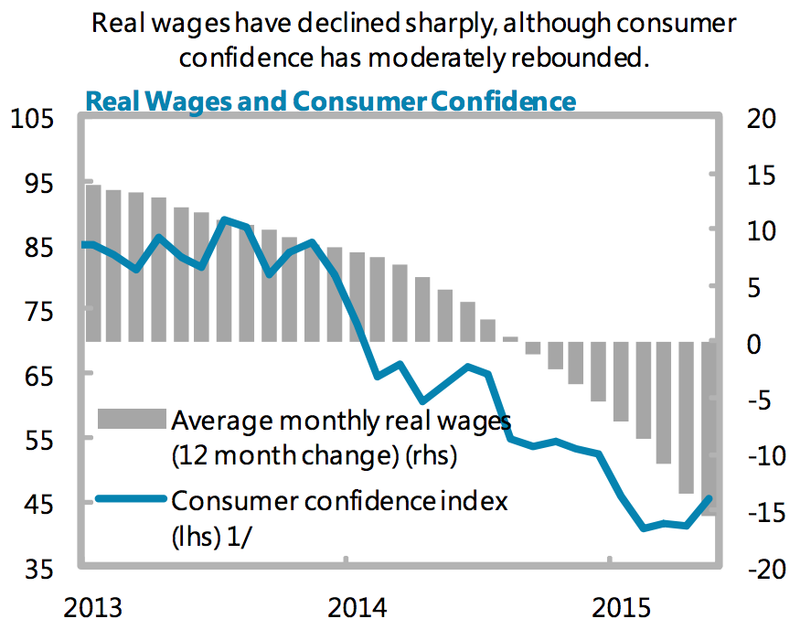 "Inflation is projected to recede quickly in 2016 to around 12 percent as the one-off effects subside and economic stabilization takes hold. Monthly core inflation rates are already well below 1 percent and expected to remain in such territory, as the negative output gap, subdued demand, and the stabilization of the exchange rate will put downward pressure on inflation." "The rapid pass-through of the large exchange rate depreciation in February and increases in regulated energy prices pushed inflation to 61 percent y-o-y in April. As the hryvnia recovered and stabilized in April–June, prices of some imported goods declined while increases in prices of non-tradables remained moderate. As a result, inflation in June moderated to 0.4 percent m-o-m, or 57½ percent y-o-y. The high y-o-y number masks the sharp disinflation that has already occurred: the seasonally adjusted annualized inflation in May–June 2015 fell to 13 percent." But energy prices are yet to be fully inflated to their targets, so more is to come: "Gas and heating prices increases. Gas prices for households were increased by 285 percent on average, effective April 1. Heating prices were also increased by 67 percent, effective May 8. Despite these increases, gas and heating prices remain among the lowest in the region. The program aims to reach 75 percent of cost recovery gas and heating prices based on international prices by April 2016 and 100 percent by April 2017." Which, of course, means there will be much more pain for ordinary Ukrainians, comes winter. 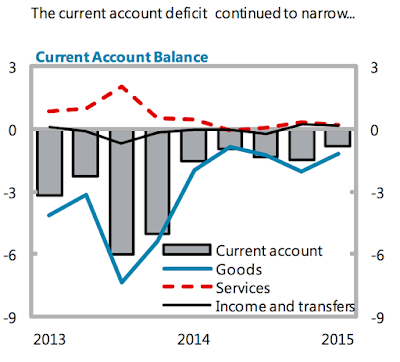 "The overall balance of payments remains broadly unchanged. 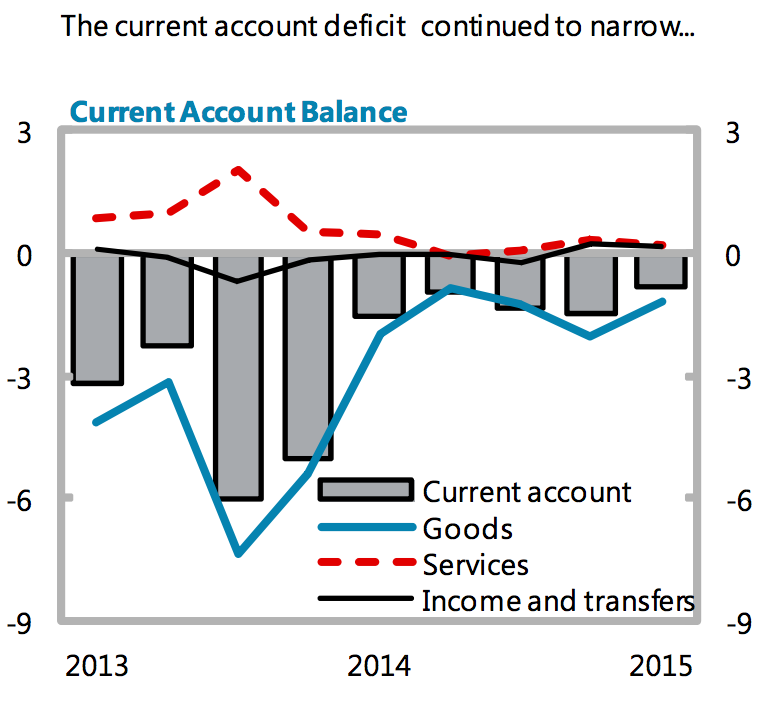 The current account deficit is expected to widen to 1.7 percent of GDP in 2015, compared to 1.4 percent of GDP at program approval. Both exports and imports are projected to decline considerably this year, driven by (i) falling export prices and larger-than-expected loss of export capacity stemming from the conflict; and (ii) the weaker economy and steeper fall of energy consumption." 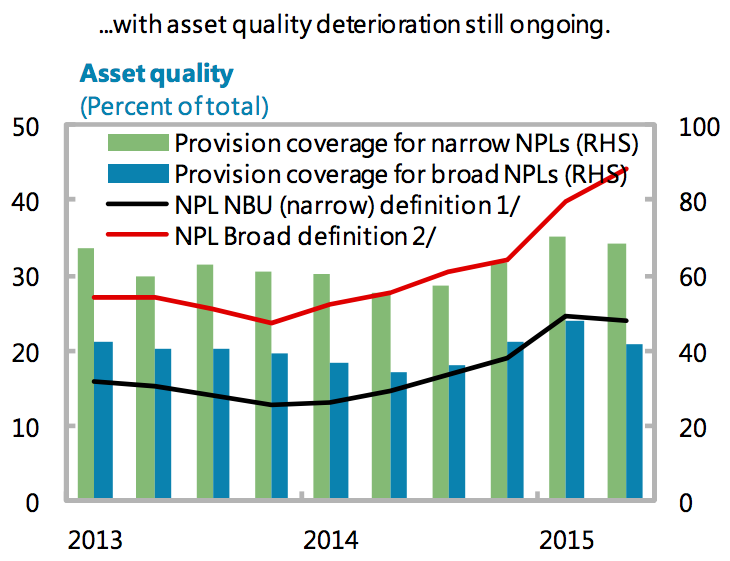 "Risks to the outlook remain exceptionally high. 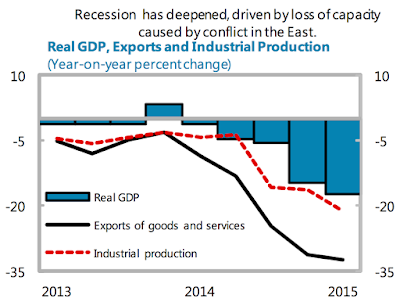 Risks to economic growth are predominantly on the downside reflecting (i) uncertainty about the duration and depth of the conflict in Eastern Ukraine; (ii) prolongation of the discussions on the debt operation (which could disrupt capital flows); and (iii) slippages in policy implementation. In addition, confidence could fail to revive due to these factors, or due to a more protracted bank resolution process. Higher-than-expected inflation—due to inflation expectations becoming more entrenched—could reduce domestic demand further. On the upside, an early resolution of the conflict could boost confidence and growth faster than projected." 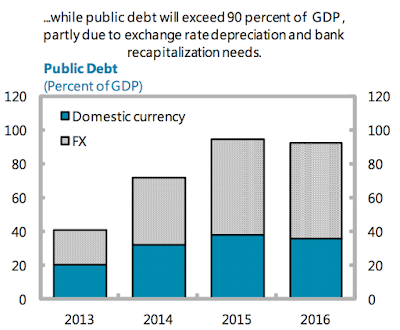 "…Regarding program implementation, policy reversals, including regarding the flexible exchange rate policy and fiscal/energy price adjustment could lead to continuing balance of payments problems and raise repayment risks." "Against significant headwinds, the authorities showed again their determination to stay the course of the program. ...However, although domestic support for a new Ukraine is strong, pressures from populist forces and vested interests are growing. Moreover, the local elections in the fall pose a risk that the reform momentum could fade." 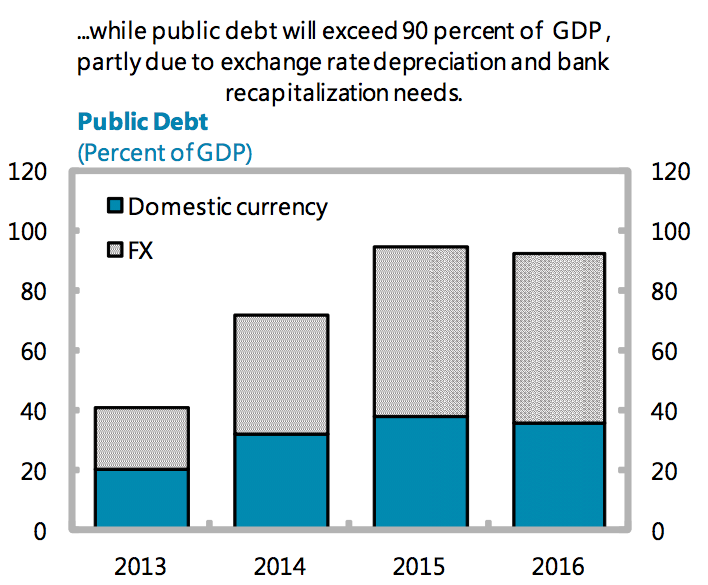 Note: Public debt levels assume meeting IMF target for restructuring current debt. 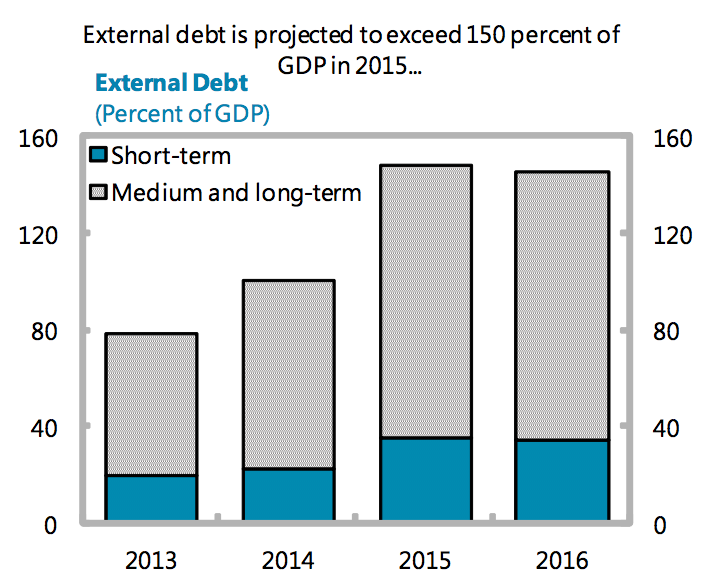 There is another dreamy feature to both graphs - as with all IMF programmes, debt peaks out in year one. Given past histories, however, the forecasts don;t quite turn to reality.